Do you ever wish you could remodel your kitchen and cozy up in your dream room with a cup of coffee on a lazy Saturday morning? Chances are the staggering cost is too intimidating to even entertain the idea. After all, a kitchen remodel isn’t exactly known for its affordability. 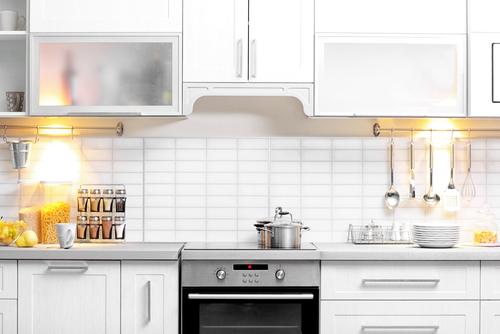 According to research from HomeAdvisor, the national average for a kitchen remodel runs $22,603 with the typical range spanning from $12,561 to $33,993. But you can still make some easy and inexpensive upgrades for your kitchen, even if you don’t have tens of thousands of dollars laying around. You just need some ingenuity and a strategy in place to maximize your budget. Here’s how to get started on upgrades for your kitchen that make it look like a million bucks. Ever day dream about what it would be like to have more counter space or a second stove? Those upgrades can get pricey fast, but you can still find a compromise with some creativity. Start by adding a rolling island to your kitchen so you can glide it up next to your stovetop area to expand your counter space. Then take it a step further and add a hot plate to keep pots and dishes warm while you are working on another part of the meal. The end result is a high-functioning kitchen that feels like you have more countertop and stovetop space than you really do. The best part is, you can tuck away the hot plate when you’re finished cooking, and roll the island somewhere else in the kitchen when you need to change up your countertop configuration. Rehauling the lighting in your kitchen doesn’t have to be expensive if you focus on fixtures that make a big impact. Invest in a few oversized, hanging light fixtures to create the illusion of higher ceilings while enhancing the natural light you have to work with. You can pick and choose your favorite style — from urban to farmhouse classic to vintage — to create a look you love. Crown molding adds a touch of luxury to your kitchen without breaking the bank. Add to your baseboards, ceiling or cabinets to give your walls more depth and dimension. Consider painting them a vibrant pastel to add a splash of color to your kitchen or opt for classic white. Finish off with framed artwork or mirrors to further enhance the look of luxury in your kitchen. Kitchen cabinets are expensive to overhaul. Instead of reinventing the wheel and blowing up your budget, you can paint your cabinets instead. Or you can reduce your painting costs even further by removing your cabinet doors to display pretty dishes and glasses on open shelving. The next step is thinking about your cabinet pulls. Upgrade to luxurious looking pulls from vintage stores, estate sales or garage sales. You can even post on a site like Nextdoor to ask if anyone has free pulls from their own kitchen remodel that they’re willing to part with. Although a kitchen remodel and a full upgrade can get expensive quickly, there are plenty of small things you can do to make a big impact. From hot plates to cabinet pulls, your kitchen upgrade can be budget friendly with a quick turn-around. You’ll be sipping coffee in your dream kitchen in no time.